A thrilling collab from some of my favorite labels including I, Voidhanger, Vendetta, Daymare, and Sentient Ruin is prone to being an essential black metal release. The latest addition to this blasphemous legacy is Abstracter's latest opus, Cinereous Incarnate. This is an album that isn't just stunningly bleak, it's got the sort of incredible balls and skull melting torment that makes for endless listening. 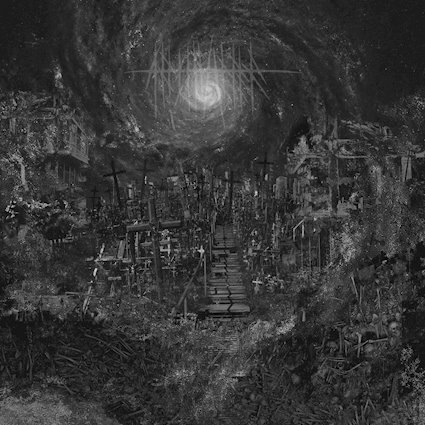 There are few black metal albums that so perfectly sum up the inherent horror of black metal as a genre, this one goes beyond the pale, serving to rip us limb from limb and remind us why we got here in the first place. The ominous trudge of Cinereous Incarnate is the result of years of honed efforts. This is the bands third full length and perhaps the most fully and elegantly conceived to date. Abstracter's ability to conjure up incredible and death defying atmospheres is impressive to say the least. Not only that though but there is something with the guitar tone that almost suffocates the listener. You find yourself drowning under a sea of volume and loving every oppressive minute of it. Yet despite how abstract this record can be and the familiarity with the scene needed to 'get it' there are some undeniable grooves that make it easy to sink in to what's been painted here. Abstracter crawl forward, covered in their own filth and loving every minute of it. The magical devastation of a song like Wings Of Annihilation is not to be underestimated and is a clear indicator of the bands songwriting talent. Cinereous Incarnate is not just a masterful release - it's symbolic of all that black metal can be. It is mesmerizing and cruel, over the top and punishing, and this is why I can't help but to admire it. Alienating and wonderfully deep, I'm excited to delve once more into this rabbit hole.